The Buffalo Bills promote responsible drinking and positive fan behavior at New Era Field. The Bills Fan Code of Conduct and the details of the Bills alcohol management plan that appear below ensure that fans have a safe and fun experience. Night Games: Same as day games, but subject to management’s discretion for individual games. Fans are encouraged to alert stadium officials of Fan Code of Conduct violations. TEAM Training is conducted at New Era Field by the Buffalo Bills and Delaware North Sportservice. 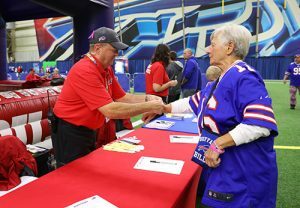 The Buffalo Bills and Delaware North Sportservice at New Era Field has consistently won training awards from TEAM Coalition. The Buffalo Bills encourage fans to participate in the Bud Light Good Sport designated driver program and pledge to be a Good Sport / designated driver on gameday. 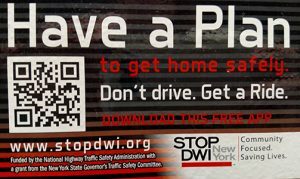 Guests who are 21 years of age or older can register to pledge to not drink alcoholic beverages at a Bills game, and to provide responsible transportation for all members of their party. Guests who pledge will also be registered for the Responsibility Has Its Rewards Sweepstakes and a chance to win a trip to either the Super Bowl or Pro Bowl, courtesy of TEAM Coalition. 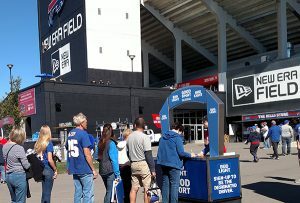 Guests are encouraged to visit any Guest Service Booth or the Bills / Bud Light Good Sport cart, located inside Gates 2 and 7, and on either side of the 300 level to register to win! Clubs with any of our Premium Service Ambassadors. 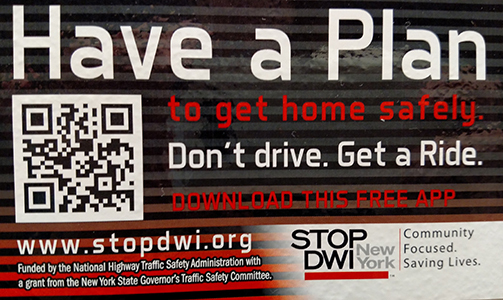 The Buffalo Bills, in partnership with Designated Drivers of Buffalo, offer an alternative to driving in order to ensure that guests return home safely. Guests who are uncomfortable driving home have access to this unique service by calling (716) 713-7703. The Buffalo Bills were four-time winners of the NFL Responsibility Bowl in 2014, 2015, 2016 and 2017. 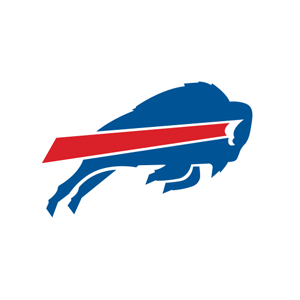 The Buffalo Bills were four-time winners of the Bud Light Good Sport Designated Driver Challenge among AFC East teams in 2014, 2015, 2016 and 2017. This is a League-wide bracket style competition hosted by TEAM coalition that gives teams points for designated driver signups use of their team-specific responsibility hashtag #BillsFansNeverDriveDrunk. We value your enthusiasm, but ask that all fans exercise good judgment and observe the Fan Code of Conduct. Please observe the rights of others by displaying proper decorum. Season Ticket Account Holders are responsible for their conduct as well as persons occupying their seats. 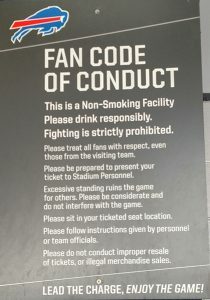 Violations by either the Season Ticket Holder or anyone occupying the seats will result in having season ticket privileges revoked without reimbursement to the Season Ticket Account Holder and/or the holder of the ticket license, at the discretion of the Buffalo Bills. Should you observe any of the above violations, please contact a stadium team member to report the problem or contact the Game Day Fan Hotline by texting BILLS , followed by your location and issue to 69050 or calling (716) 312-8933.